As a climax to the incredible Dominion invasion arc Favor the Bold & Sacrifice of Angels inarguably left a major mark on the series. But how much credit do they deserve as an isolated two-hour tale versus being key parts of a grander whole? This week hosts Cam Smith and Tyler Orton, along with special guest Waylon Snedker, solemnly pass the baseball around while delving into this spectacular sixth season shakeup, wherein Starfleet battles to take back the titular space station from Gul Dukat and his Dominion accomplices. Does this mark the beginning of the narrative end for the Cardassian villain? Is Sisko being strategically smart or just plain reckless in his dogged attempts to win the day? And what does the death of Ziyal truly mean to the show and viewers? Tune in as the trio break down the themes, concepts and unforgettable moments contained within this crucial wrap-up story. For all of its beaming optimism and can-do pluck Star Trek loves to occasionally journey... into darkness. This week hosts Cam Smith and Tyler Orton decide what they can and can't live with while exploring the most uncomfortable, grim and challenging episodes in the franchise's canon. 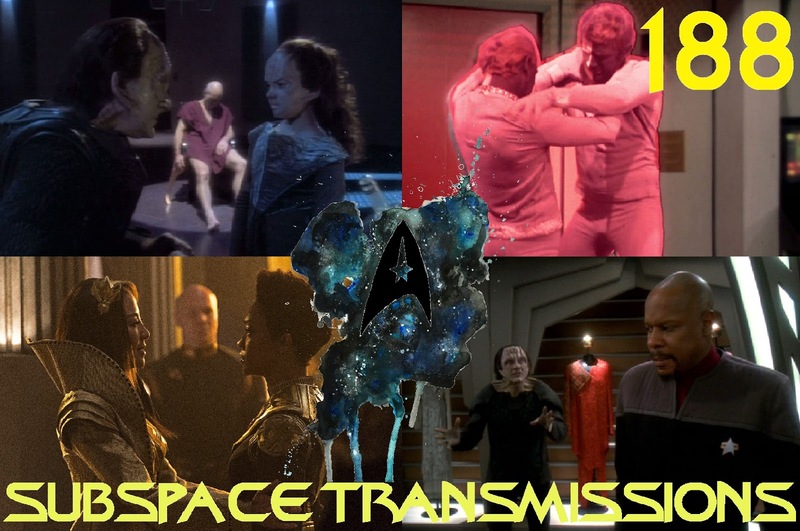 From Sisko's dirty dealings in In the Pale Moonlight, to Discovery's Mirror Universe moral murkiness and TOS's eternally warring duo-chromatic aliens, the duo underline the episodes that left them shaken, weary and even a little scarred. 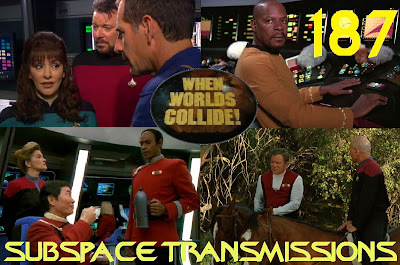 And, in reliving these often unpleasant television hours, they ask the fundamental question: do these emotionally draining adventures fit into Roddenberry's utopia? Who can ever forget when the Flintstones met the Jetsons? Or Batman & Robin teamed up with the Green Hornet & Kato? Since nearly the beginning of the TV era crossovers have been a proven means of boosting ratings and injecting energy into a series. And Star Trek has definitely gone to this particular well more than a few times. This week hosts Cam Smith and Tyler Orton take a reflective look at the many times the people in charge of the franchise have attempted to grab eyeballs and generate fan excitement by mashing up their titanic properties. 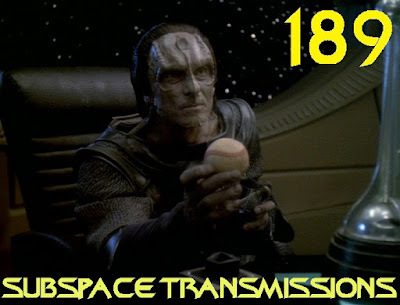 From the Enterprise-D swinging by Deep Space 9, to Sisko's Tribble troubles and Tuvok and Janeway's mind meld tour of Captain Sulu's Excelsior, the duo debate how successfully these attention-grabbing stunts have held up beyond their initial hype. Also, as an added bonus, Cam reviews IDW's new Stamets-centric Discovery double-sized annual. Remember at the end of All Good Things... how Troi and Worf appeared ready to embark on a potential long-term romance? Boy, that sure paid off! But then, the TNG crew experienced so much off-screen change and growth in the eight years between the finale and Nemesis... In an attempt to settle their restless continuity-obsessed minds, this week hosts Cam Smith and Tyler Orton form a two-man writers room to decide which unanswered questions most demand answers in a hypothetical reboot bridging the crucial post-series/mid-film time gaps. For example, what were the deciding factors behind Geordi's switch to ocular implants in First Contact? How did the crew occupy themselves while the Enterprise-E was under construction? 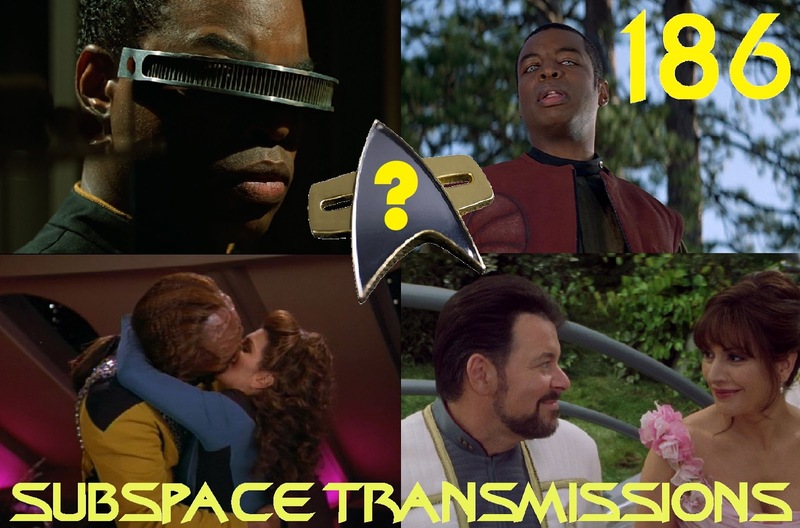 And what were the circumstances surrounding Wesley's return to Starfleet and Guinan's exit post-Generations? If you've ever spent time pondering the staffing issues caused by Worf's sporadic movie-required reappearances on the bridge this is the episode for you!